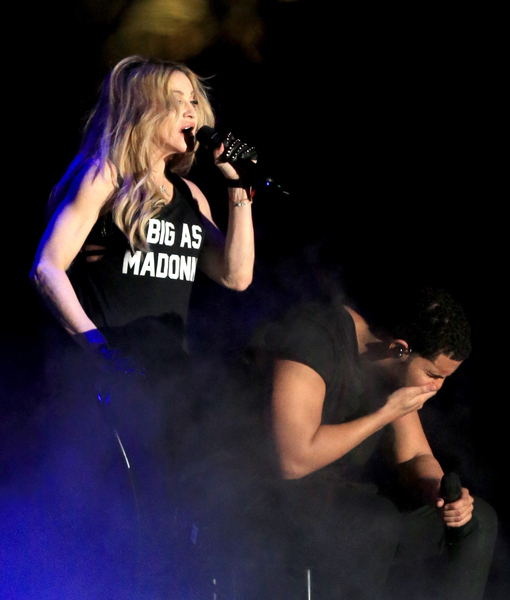 What Drake Is NOW Saying About the Infamous Madonna Makeout! The kiss that launched a thousand… MEMES! Unfortunately, Madonna’s 8-second kiss with Drake at Coachella didn’t quite get the same reaction from fans as when she made out with pop princesses Britney Spears and Christina Aguilera at the 2003 Video Music Awards. In case you were sleeping off Coachella, the 28-year-old rapper was photographed with a shocked expression on his face moments after his makeout session with Madge, but the rapper revealed it wasn’t disgust that caused him to wipe his mouth, but instead it was Madonna’s lipstick. Drake took it a step further by expressing his love for Madonna… and the kiss on his Instagram. See more music moments, celeb sightings, and fringed fashion from the Coachella Valley Music and Arts Festival here. Watch Madonna Go Apocalyptic in New ‘Ghosttown’ Music Video!